1970: I began writing detective/adventure stories for my own amusement. Over the following six and a half years, I wrote over 100 stories. 1981: Had my first comedy sketch,’Father of the Bride’ performed in a variety concert in Rathowen. 2000-2018: I have written 21 three-act comedies. 2018:’Mammy’s Boy’ was staged in Chicago by the Gaelic Park Players and was also staged at the Acting Irish International Theatre Festival in Calgary, Canada. My latest three-act comedy, ‘A Fish Out Of Water’ was premiered in Mallow, Co. Cork by On Q Productions in November 2018. It was one of 40 productions of my plays in last year. I am currently writing a new three-act comedy – my 22nd – which is called ‘For Love And Money’. Welcome to my website. Feel free to contact me if you want to know any more. Thanks for the Facebook message. Been busy getting my next short Gothic Horror story ready for filming in the US next year. I like your website very much. Jimmy Keary is my favorite Irish Playwrite……..Oh hell…he’s my favorite playwrite PERIOD and I have had the great joy of reading his plays BEFORE they were produced. Thank you for those comments, Ron – you have been very encouraging and supportive of my playwriting since I got to know you, must be five or six years now. I really appreciate it. Not sure if I’d be safe in Cabot Cove – it seems to be a very dangerous place to live. Thanks again. Jimmy Keary website – wow! 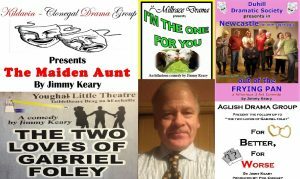 Congrats on the new website Jimmy – Portumna Players are really looking forward to staging The Two Loves of Gabriel Foley in January – all very upset to have postponed the premiere this week-end but it will be worth waiting for! Enjoyed reading the update on your site…Stay well and God Bless. Congratulations on your new website. Loved our visit this summer. I still say you are the handsome one of the family. I intend to check the site out regularly. Congratulations on your new web site – it really looks fantastic. Wishing you every success in the future – hope you don’t forget the poor relations when you are a rich and famous playwrite !! Congratulations on the website and on the Shannonside interview. Continued success with your work. That’s great to hear. Thanks for taking the time to post the message. Looking forward to seeing you all tonight. Best wishes on the website Jimmy – great stuff – Not looking forward to the video’s though – photo’s are bad enough! Thanks for the good wishes, Tom. A handsome fella like you shouldn’t be bashful about photos or a video. Now, me, on the other hand, who has to delete a lot of my photos…..Mind you, I think you have a secret pact with some gremlins as the guy who built the website is having trouble uploading that video. Thanks, Margaret, I hope you enjoy it. There’ll be updates about it here and on my facebook page. have the Playwright and the Lord Mayor of Armagh present in the audience, a little nerve-wracking! in the Market Place Theatre Armagh on 23 rd September last. Love your plays so much we are going with ‘Fortunes And Misfortunes’ this year on 4th ,5th, 6th March. Best wishes from all the gang in Derrynoose. Back again Jimmy, your new website is great and best of luck with it! I will be checking it regularly from now on! Just read through again and I’m not sure if my first comment went through. I was letting you know that we are staging The Two Loves of Gabriel Foley on sat 19th, sunday 20th & monday 21st March, late in letting you know as we had to postpone for a week as usual as we are doing so much laughing in rehearsal that we cannot learn our lines! If the people that come to see our performances find it as funny as we do, they will have tears running down their faces from start to finish! Great play and great fun, well done as usual and thanks a million! Great website. Just finished our prodution of “The Maiden Aunt” in Mountcoal on Sunday and topped off with a visit from the Minister for Arts, Heritage & An Gaelteach, my class mate Jimmy Deenihan T.D. who had just come back from London a couple of hours earlier. We had a fantastic reaction to our production and the laugh that was had was a welcome relief to the doom & gloom present at the moment and the to top it off with a visit from our first local full Minister who spoke very positive about our drama group and our community. Cheers Jimmy and keep writing comedies – there is nothing like a laugh. I’m glad the play was such a success for the group after all the hard work they put into it. And then to have the new Minister there on the closing night was a big coup. I’m sorry I didn’t get down to see it. I’m looking forward to seeing the dvd. Give my best wishes to everyone involved. Best wishes on your new website. Just been to see one of your plays ‘ The Maiden Aunt’ by the St. Senans Drama Group in Mountcoal near Listowel. One of the best productions I have seen on any stage. Very witty and insightful about country life. Thanks for taking the trouble to contact me. I’m glad you enjoyed the play. It’s one of my most popular and was being staged near Ballina in Mayo at the same time. If you want to read a piece about how I wrote it, click on the ‘February Archives’ on this page, scroll down and find ‘Writing The Maiden Aunt’. Another of my plays, ‘Looking For Love’ is being staged in Listowel in April.. Thanks again for the message and good wishes. Looking forward to visiting with you .I’ll be at the wedding in April .Congratulations on your latest play .Your last one was great .I went to Gealic park in Chicago to see it and was thrilled . Good for you Jimmy..
Once again I am honored to have been allowed to read the new play. It is , as expected, a winner…Every Character has lines all actors live for.For the theatre goer another fun filled evening of laughter,,,Congratulations Jimmy…God Bless. Picked up your flier in Drogheda Library. Congratulations on your new website I will be keeping my eye on facebook too. Would love to see your plays will you ever bring them to Drogheda? I have penned a play myself some years ago and trying to get another on paper at the moment. I also have a book of funny poetry aimed at women but don’t really know who to approach to publish would you have any information for me? in Rathowen Community Centre from Fri 11th – Sun 13th looks like we’re sold out for Saturday the 12th and Friday 11th looks good too so the heat is on!! I can feel the heat, too, Betty! Best wishes to everyone involved! And thanks for the comments about the website. Just finished 5 nights in the Droichead Arts Centre, Drogheda with “The Yes Man”. Audience thoroughly enjoyed it as did the cast. Fantastic feedback. Looking forward to seeing production of your plays in the East Coast. I’m so glad the play was such a success for you, Angela! Give my congratulations and best wishes to the cast.